The Vancouver Playhouse opens its 48th season with world’s longest-running musical The Fantasticks. 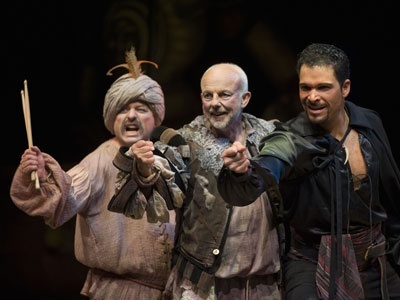 Simon Bradbury, Christopher Gaze and Steve Maddock in The Fantasticks at the Vancouver Playhouse. Book and lyrics by Tom Jones and music by Harvey Schmidt. Directed and choreographed by Max Reimer (Dirty Rotten Scoundrels , Playhouse), with musical direction by Bill Sample (Beyond Eden, Playhouse). Set design by David Roberts, costumes by Christine Reimer, and lighting by Gerald King. Starring Steve Maddock (Beauty and the Beast, Arts Club), Colin Sheen (Dirty Rotten Scoundrels, Playhouse), Bree Greig (Bat Boy, Patrick Street), Mark Burgess (The Drowsy Chaperone, Playhouse), Andy Toth (The Full Monty, Patrick Street), Christopher Gaze (Bard on the Beach), Simon Bradbury (Oliver!, Playhouse) and Jeff Hyslop (The Music Man, Playhouse). The Vancouver Playhouse Theatre Company presents The Fantasticks from October 2- 23, 2010 at the Vancouver Playhouse Theatre, Hamilton and Dunsmuir. Tickets are available online or by phone at 604-873-3311.